“You must practice Bach. It is the music of Gott!” Thus, I was regularly instructed by the elderly German ladies at St. Pauls United Church of Christ in Chicago, the church in which I was raised, during my earliest years as a violinist. I was fortunate to grow up at St. Pauls, a church with a deep dedication to music. The church has been a spiritual home to opera singers and members of the Chicago Symphony Orchestra. Oratorios, cantatas, and other choral works of the great classical composers are often performed as part of the service, and the music of Bach is celebrated above all others. The sanctuary itself even features a stained glass window of Bach. I have vivid memories of spending Sunday mornings surrounded by the glorious sound of Bach’s Toccatas and Fugues on the organ. I have to confess that I have not been keeping up with the music world and RachelBartinPine.com as much I should have. While this is due to the amount of study for a late starting musician/beginner violinist like me, the subject of Bach and in Particular Bach’s 6 Sonatas and Partitas for solo/unaccompanied violin (and violinist) is always indispensable. The subject of Bach alone is takes eternal study, never mind music of the great composers! In the vast repotoir of violin compositions, the are only a few (major) unaccompanied violin compositions, as far as I know, but in any case the Bach’s 6 Sonatas and Partitas can probably be considered as part of the Violin and the Violinist instead of something external to the instrument and the musician than simply compositions to be played. As far as I know, Bach’s six Sonatas and Partitas, Paganini 24 Caprice, Bach Well Tempered Clavier and the Beethoven 32 Klavier/Keyboard Sonatas are the defining sets of music as well as being the same for their respective voices. 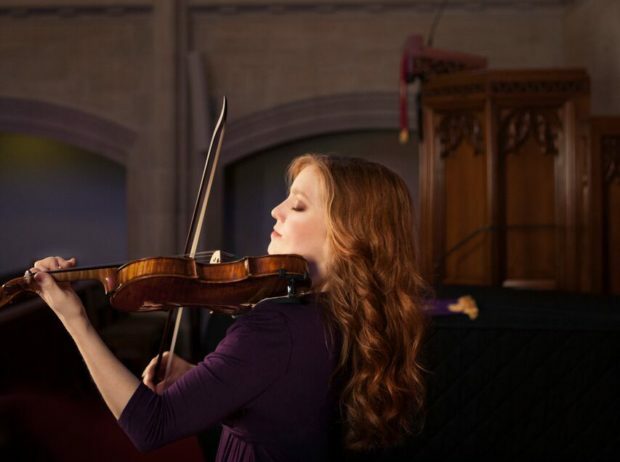 Since this is a comment section, I took the liberty to do so, but in the end we owe much of music to Bach (and developed to the extreme by Paganini and Beethoven), and especially to Rachel Barton Pine (one of the few (I mean single digits few) truly great musicians/violinists/composers of our time) on doing what she does, and in sharing at length on the subject of Bach (who devoted himself to music put of Love and God, which I dare say is the same thing…), and lead us to have a glimpse of her church, musical church that have not forgotten Bach as one of his most faithful and successful servants! And yes, the Recording of the defining Bach’s Six Sonatas and Partitas by the defining Violinist Rachel Parton Pine and her extraordinary Violin does not come too soon!!! My usual deficiencies go being ahead of myself, under prepared and over enthusiastic, and may be I should not have written previous comments! I first became aware of Rachel Barton Pine’s Bach’s six Sonatas and Partitas for solo Violin (and Violinist) recording in checking her web site here on my Phone, and naturally not listened to it due to the fact I know the built in speaker in my phone cannot do any justice to the violin, never mind an amazing Violinist! But today, I get a rare opportunity to sit down on my desk top, with the plan of ordering some CD’s, and since my desk top has adequate speakers that would be somewhat respectful to the Composer, the Violinist and music, I allowed the sample on Rachel Barton Pine’s Bach’s six Sonatas and Partitas for solo Violin (and Violinist) to be played through my machine online. I WAS UNPREPARED FOR THIS!!!!!!!!! In all my life, I have never had such a music experience, and I have never had such a religious experience, and if religious experience is defined by this, no, it exceeded the threshold for an religious experience by far: it is an a religious experience through music, in a multidimensional way…I would say, though one hear some of the Sonatas and Partitas played often my famous violinists,I have never really understood the meaning of Bach’s 6 Sonata’s and Partitas, even though I know of it’s place and necessity in the music repertoire, until now!!!!!!!!!! I had to stop the streaming immediately because I was so caught off guard that I must wait till I get the CD, and I promise myself I must get the best speakers I can afford before I listen to this recording. I dare say in my humble opinion most CD’s by most other artists owe much of their effects and qualities to the hall acoustics and signal processing, but what happens when one takes away the hall and the editing, well, often it kind of sound like what one hears walking pass a high school music room, but what if one starts with the best ingredient i.e. amazing music played live by Rachel Barton Pine who does not need a hall to create music beyond what is possible to be reproduced on a CD or recording an any way, then add a Church that she knows well? It becomes a CD that that has the acoustics and music I have never before heard. It is akin to always imagine what it would be like to go to space but when you do go, it’s nothing like anything you could imagine! I is how I feel about this recording without exaggeration with lack of many better words. I have never gone a day without music and the voice of the violin, and I in the past went to as many great live performances as I could manage, and even though I was lucky to have heard Rachel Barton Pine perform live, nothing has prepared me for this! I believe anyone who has time on this planet must experience Bach and Beethoven, and must have this CD, “TESTAMENT: COMPLETE SONATAS & PARTITAS FOR SOLO VIOLIN BY J. S. BACH!”, Rachel Barton Pine, Violinist!!!!!!!!!! What I mean it’s that it is by far the best Bach solo violin there is, to the point of religious experience through music, one does not need the other stuff: I don’t mean this CD is background music. In fact I cannot casually listen to the sample, thats why I had to hit pause on the streaming, I’ll have to find a place and time to dedicate to listening to it (on CD) for the first time! I can’t wait for the CD to arrive!! !